Configuring a data source in Report Designer provides Geocortex Reporting with the information it needs to connect to the data source and query it for data to include in the report. You only need to configure a data source once. You can then use it in any report that you author. To configure a data source, you first specify the type of data source, for example, ArcGIS, SQL Server, Oracle, and so on. This is the provider. You then configure the individual connection settings that are required by that data source. Geocortex Reporting builds a connection string from the settings that you configure. When a user runs a report, Geocortex Reporting uses the connection string to initiate a connection with the data source. You must know in advance what information is required to connect to a particular data source. If you aren't sure, ask the data source's administrator or refer to a resource like The Connection Strings Reference. Reporting supports two types of data source out of the box—ArcGIS and SQL Server. These providers work in both on-premises Reporting and cloud Reporting. You can use a wide variety of other providers with on-premises Reporting by installing the provider's driver on your server. To add a data source, click Data Sources | Add Data Source. You are presented with a list of providers to select from. The list contains the two out-of-the-box providers, ArcGIS and SQL Server. In on-premises Reporting, additional providers may be listed if Report Designer finds an installed driver for the provider. The Other option allows you to configure the connection information for providers that do not appear in the list. Geocortex Reporting supports ArcGIS map services and feature services as data sources. 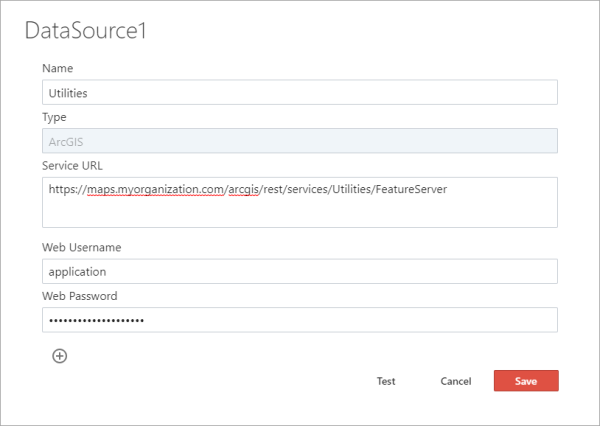 Federated Security: If the service is federated with ArcGIS Online or Portal for ArcGIS, you do not need to configure a user name and password. Geocortex Reporting uses available information to access federated services. Web-Tier Security: If the service is secured using web-tier security, you must configure the Web Username and Web Password settings. Use the Add Parameter function to add the settings. Token-Based Security: If the service is secured using token-based security, you must configure the Token Username and Token Password settings. Use the Add Parameter function to add the settings. Data Sources panel: This is the general method to configure data sources. Layer Report Wizard: The Layer Report Wizard creates a report that is bound to an ArcGIS data source and takes a list of feature IDs as input. The wizard has a Use a new ArcGIS layer or table option that provides a step to configure the service's URL. If the connection requires additional settings, for example a user name and password, you cannot use the Use a new ArcGIS layer or table option. You must configure the data source in the Data Sources panel before running the wizard. You can then use the wizard's Use an existing data source option to create a layer report that is bound to the data source. To open the wizard, click File | New | Layer Report Wizard. In Report Designer's sidebar, click Data Sources. Click Add Data Source and select ArcGIS. You can also configure an ArcGIS data source from scratch using the Other option. In the Name box, type a name for the data source. Choose a meaningful name. If you change the name after you have added the data source to one or more reports, the data source will be removed from those reports. You will have to add back the data source under its new name and reconfigure it in each report. 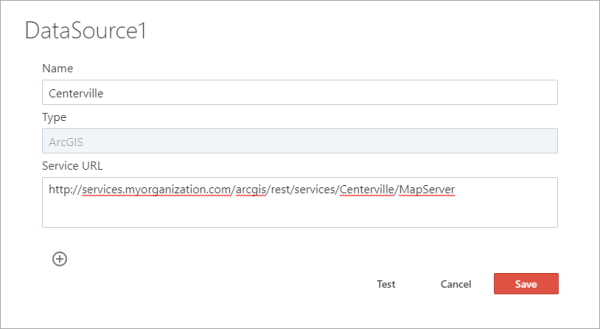 In the Service URL box, type or paste the URL for the map service or feature service. This is the URL for a service, not a layer. You will specify the layers later, when you add the data source to the report. Click Add Parameter and select Web Username to add the setting to the panel. Type the user name in the Web Username box. Click Add Parameter and select Web Password to add the setting to the panel. Type the password in the Web Password box. Click Add Parameter and select Token Username to add the setting to the panel. Type the user name in the Token Username box. Click Add Parameter and select Token Password to add the setting to the panel. Type the password in the Token Password box. If you ever need to change the password for an existing data source, you must type the full password. Editing selected characters in the existing password will fail. Click Add Parameter , select Other, type the name of the setting, and click OK. The setting is added to the panel. Use the setting name defined by the provider. This ensures that the provider will recognize the setting. Refer to the provider's documentation for information. Repeat these steps for each additional setting. If the test fails, verify the information you have configured and make corrections as needed. Make sure you have specified the URL to the service, not to a specific layer. The data source is listed on the Data Sources panel. Click away from the Data Sources panel to close the panel. Click Add Data Source and select SQL Server. You can also configure a SQL Server data source from scratch using the Other option. In the Data Source box, type the location of the server, for example, localhost. DataSource will always be used, as it points to the location of the SQL instance, either by common name or IP address. In the Initial Catalog box, type the name of the database. Type the user ID in the User Id box. If the setting that you want to configure appears in the list, select the setting. This adds the setting to the panel. If the desired setting does not appear in the list, select Other, type the name of the setting, and click OK to add the setting to the panel. Besides the out-of-the-box providers, ArcGIS and SQL Server, Geocortex Reporting supports many other providers, such as MySQL, PostgreSQL, Oracle, Oracle ODP.NET, Oracle ODP.NET Managed, and more. To use other providers with Geocortex Reporting, you must install drivers for the providers. Because they require you to install a driver, other providers are only available for on-premises Reporting. When you configure a data source in Report Designer, Report Designer detects which drivers are installed and lists those providers in the drop-down list. In this case, you can select the provider from the list to configure its connection information. If the provider is not listed, select the Other option. Click Add Data Source and select the type of data source. If the desired type is not listed, select Other. The XpoProvider setting specifies the provider, for example, Oracle, PostgreSQL, or MySQL. To find out the value to enter, see Connection Information for Selected Providers. Configure the settings that are needed to connect to the data source. If the setting does not appear in the list, select Other, type the name of the setting, and click OK to add the setting to the panel. Repeat these steps for each setting that does not appear in the panel. The following table provides examples of connections for different providers. In the examples, the configured settings and their values are represented as setting Name: value. To use this provider with an on-premises installation of Geocortex Reporting, you must install a driver. This provider is not available in Geocortex Reporting in the cloud. This provider is available out of the box in both Geocortex Reporting in the cloud and on premises. To configure a SQL Server connection from scratch, click Add Data Source, select Other, and set the XpoProvider setting to MSSqlServer. Use the Add Parameter function to configure the other settings that the data source requires. Changing the connection information for a data source changes it for every report that uses the data source. For instructions on changing a single report to use a different data source, see Modify a Report to Use a Different Data Source. Click the data source that you want to modify. Alternatively, click beside the data source and select Edit. Modify the data source as desired. To remove a setting, delete the setting's value. If you need to change the connection information for an existing data source, you may have to remove connection settings that no longer need to be configured. Report Designer does not provide a function to remove existing settings. Instead, delete the value of the setting and save the connection information. The next time you open the data source in the Data Sources panel, the setting will be gone. In the Data Sources panel, select the data source. The data source's settings show. Delete the value from the setting that you want to remove. Click away from the Data Source panel to close the panel. To verify that the setting has been removed, re-open the Data Sources panel and select the data source.